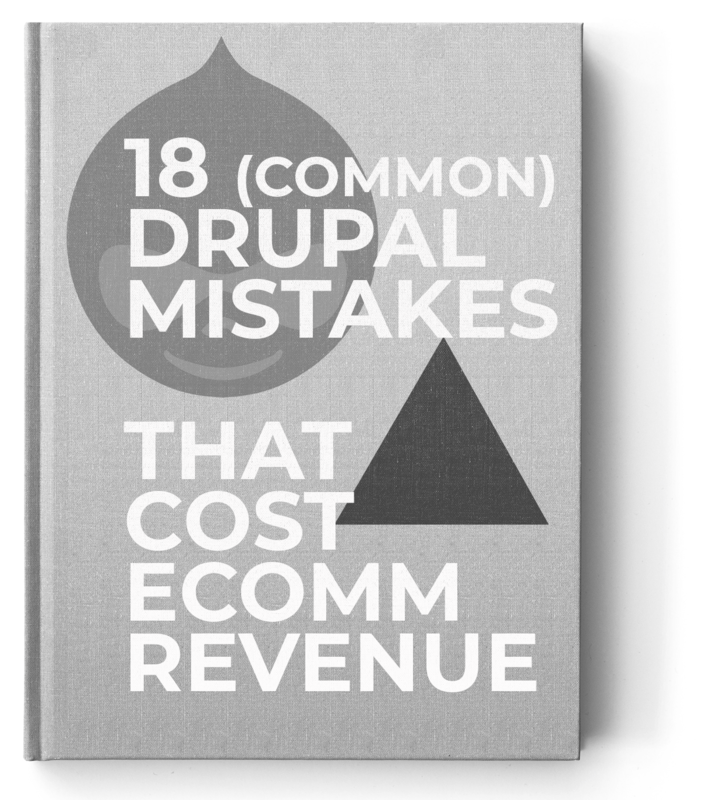 It’s rare to find Drupal sites that are optimized to be revenue-driving machines for their marketing departments and companies. Often one of the Drupal or Digital Foundations is overlooked, misconfigured, or out of sync with overall digital strategy. It takes a careful eye to review and visualize the entire customer journey, ensuring a consistent, high quality experience for customers, search engines, and the teams responsible for keeping the content and marketing machines running. A holistic review of the full-stack digital experience is required to ensure a successful and cohesive experience those same customers, search engines, and employees. To keep your sales engine humming we’ve built a checklist to ensure your website is ready to maximize your return on investment from campaigns quarter over quarter. Various components of your eCommerce Drupal configuration may adversely impact the page load times, causing friction in the shopping process. 53% of visits are abandoned if a mobile site takes longer than three seconds to load. Every 100ms counts for 1% of increased incremental revenue. Misconfigured Caching. How often do your pages expire? With logged-in shopping experiences, appropriately configuring caching is more critical, as adding to cart and checkout experiences can’t be cached, and therefore server resources must be reserved for allowing smooth checkouts. Misconfigured render-blocking scripts (JS/CSS/compression). Page speed load times can be adversely impacted by render-blocking scripts that force the entire page to wait for a third-party script to finish loading. Make sure you’re testing with PageSpeed Insights. No Content Delivery Network (CDN) configured. Content delivery networks distribute your site’s content across global servers to dramatically speed up load times. If you’re site is hosted in Eastern US, but your customer is in the Western US, even a few 100ms in difference can impact your site’s geolocalized SEO rankings, and ultimately the end-customer shopping experience. Misconfigured metatag implementation. Titles, descriptions, and Open Graph tags are the basics, but appropriately tokenized metatag defaults, configured taxonomy vocabularies, or panel pages without metatags at all are often overlooked nuances of the Drupal best practices you should be looking out for. Missing rich snippets. Drupal finally has a module that allows you to add your rich snippets easily with tokenization. Make sure that search engines consistently display the most up-to-date company and product information. Misconfigured index,follow that pollutes SEO rankings. Do you have a lot of tags, terms, and landing pages driven by Drupal’s taxonomy system? Great! Are you appropriately marking them as “noindex,follow” for robots to crawl but not display to end-customers? Pruning low quality tag pages from your index, but still telling bots to crawl your links will drive up the quality of your rankings and reduce keyword cannibalization. No automated testing. The add to cart button, checkout page, user registration, and user login are critical to your revenue growth. Losing these key functionalities, and leaving them up to manual testing on each release, wastes money and often times is gambling you shouldn’t be comfortable with. Get a solid understanding of the initial investment for automated testing, and limit the scope to things that protect your revenue until you’re ready to invest for more coverage. No visual regression testing. The delivery of the visual aesthetic is a critical brand asset that needs to be protected to ensure conversion rates and customer retention stay high. Leveraging visual regression testing allows you to keep track of how your design changes for each release—and catch UI breaking visual changes. With Drupal foundations covered, it’s important to make sure your marketing automation and third-party tools are fully integrated. The cost of launching new marketing campaigns and keeping customer data synced across tools can enable your marketing team to be agile with launching new campaigns. If you don’t invest in these solutions, your team will be left to manually push and pull data—not ideal for some of your most expensive resources when robots can be doing all the work! Exit Offer. Appropriately A/B split-test Exit Offers to maximize revenue. Abandoned Cart. Email, SMS, and Facebook Messenger chatbot abandoned cart follow ups all give conversions a lift—especially Messenger bots as customers get bombarded with increasing amounts of email & SMS messages. Extend Touch Points. Following up multiple times is often overlooked, but just a 3-day, 10-day, and personalized retargeting campaign can drive conversions. Retargeting campaigns based on lead warmth. Tailor retargeting campaigns to the full purchasing lifecycle, focusing on positioning ads depending on how warm the customer is, if they’re about to convert, or have already converted—maximizing the value of each customer acquisition. Brand Awareness. Who is your company? What does your company stand for? Product Value. What are the most profitable products in your store? Social Proof. Who is buying your products and what do they say? Abandoned Cart. What personalized recommendations do you have for customers who have visited the store? Discount for Testimonial. After conversion, how can a customer be converted into an evangelist? Lack of Personalized Recommendations. In the age of machine learning and curation, personalized recommendations are somewhere between manual effort requiring discrete segmentation, and automated effort. Set up your email, marketing, advertising, and on-site recommendations with a personalization engine. In the Drupal space, Acquia Lift, Acquia Journey, and Optimizely stand out. Lack of Customer Nurturing. Increasing average order size may require more nurturing, but the juice is worth the squeeze. As brand value and product value are more effectively communicated—a relationship is established driving higher customer Lifetime Value (LTV). Unmanaged affiliate programs. Earn sales by allowing other companies or influencers to promote your products. Simple and well-known, but not enough companies do it well. Campaigns to nurture your affiliates and promote new products can enable seasonal upswings as new products roll out. There are also Drupal modules that allow you to manage your affiliate program if you don’t already use a 3rd party solution. No User-Generated Content strategy. In a world of social media promotion and engagement, we’ve worked with companies to help capture engagement as user-generated content—enabling a lift to SEO value and long-term success. Slow and difficult to update content. Your eCommerce site should be configured to allow for ease of updates, reducing administration time and maximizing throughput. Drupal’s out of the box content and product management don’t lend themselves to getting content or products published quickly—nor do they empower content teams to take true ownership of the site.. To keep your content and products relevant, remove all barriers to management and enable your marketing team to drive growth by empowering them to make changes on the site without specialized knowledge. CRM Capture of Customers / Integration. Getting your eCommerce site to integrate with your CRM is often overlooked, but is a critical component to integrated marketing campaigns. Ensure your CRM is synced to deals in the shopping cart, Drupal webforms, content personalization system, and vice-versa, so email automation triggers and advertising automation can be triggered from the same set of properties. Transactional Email Sending / Tracking. While many who use Drupal depend on local server or SMTP solutions, enabling an API-enabled transactional email service will maximize your business performance and reduce risk. Poor email deliverability results in increased support requests—users asking about their orders, shipping, or their returns. As you grow, the overhead of dedicated support specialists (or the time of your marketing team) will be used to respond to valueless communications. Looking at your transactional email service for both deliverability and actionable email insights is key, configuring your DKIM and SPF records properly is key, and selecting a reputable transactional email service (like Mandrill or Amazon SES) is key. Integrated fulfillment to Drupal and E-Mail Marketing. Shipping and order fulfillment are critical marketing triggers. Instead of sending a shipping notification from your shipment processor, make sure the appropriate transactional email can be sent from centralized system so you can drip more information later. Sending a follow-up after the shipment is delivered is a great way to get ahead of any delivery issues, or acquire a positive review that benefits from your proactive customer relationship strategy. Pro tip: Insert a custom Facebook tracking pixel in the shipment delivery email to encourage a customer to leave a review after they receive their order.